You are currently browsing the category archive for the ‘Well-being Q&A’ category. This totally made my day! Love is powerful, indeed. 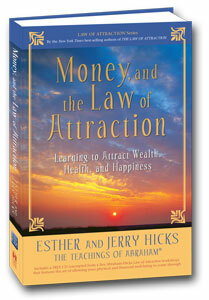 In this, the latest in the ever-growing series of Abraham-Hicks books, Money and the Law of Attraction hit some familiar high notes in its increasingly descriptive foray into the world of knowledge channeled from a group of non-physical beings called Abraham. It quickly became #1 on the New York Times Bestseller list, which doesn’t surprise me at all. There is a hunger for information regarding our part in creating the lives we live. In this latest complilation of public addresses which took place in Boston last year, readers have access to specific methodologies for aligning your vibration to what it is you want– better health, better finances, better relationships, whatever it is you are seeking. For example, Abraham goes into detail about conducting a daily 15-20 minute “workshop” which enables one to become very clear about what it is one wants. Choose a quiet space where you will not be interrupted. It’s best to use reinforcing language which puts you in a state of deep appreciation for what you already have, and then move into a deep awareness that once you’ve requested what it is you want, you do not have to ponder it again. You simply have to be excited and joyful in the knowledge that it is quickly finding its way toward you. The only thing that would prevent you from getting your request is if you consistently wonder “where is it, why isn’t it here?” This is because it is important that you are not attached to the outcome. You simply ask for what you want, be specific, feel joyful knowing that it’s already yours and literally waiting just outside of your physical grasp, and then simply expect the universe to present it. Have fun watching for signs that it’s about to appear. Where most of us trip up is in the obsessive need to “make things happen.” There is a difference between making something happen out of fear, and feeling open to inspiration and taking inspired action because it makes you feel good. I enjoyed this latest contribution to the world of understanding these powerful universal principles and appreciated the CD which came with the book.